Northern France, probably Paris, ca. 1490. Mid 16th-century French gilt-panel-stamped brown calf; traces of enamel on interlaces; stamped with the name Nicole Gerves. Gift of Ralph Friedman, 1988. Nicole Gerves (16th century); Ruth E. Friedman, New York. 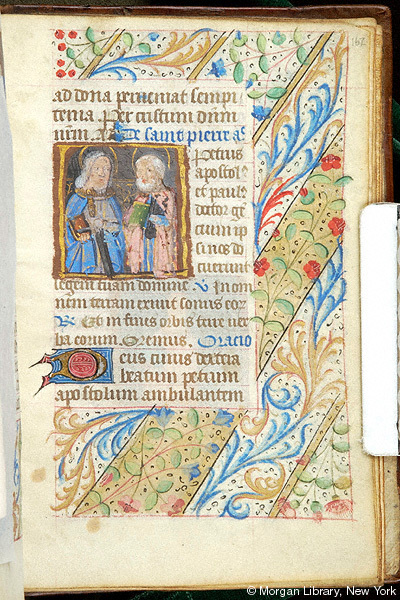 Ms. book of hours for the use of Paris (Hours of the Virgin, Office of the Dead, calendar, liturgy); written and illuminated in northern France, probably in Paris, ca. 1490. Decoration: 15 large miniatures, 2 border historiations, 18 small miniatures, illuminated initials; architectural elements and floral decoration in many borders of the leaves with illuminations.